During the end of your DAT study schedule, you should transition to completing and reviewing one full-length DAT practice test each day. Knowing the material for test day is important, but the DAT also tests how well you take the DAT. Many students spend weeks studying all the material they can, but test day distractions such as a different environment, computer screen, or ticking clock, will make them nervous. Once you get nervous in a testing situation, you begin having trouble doing easy calculations, make simple mistakes, doubt your answer choices, and waste time. 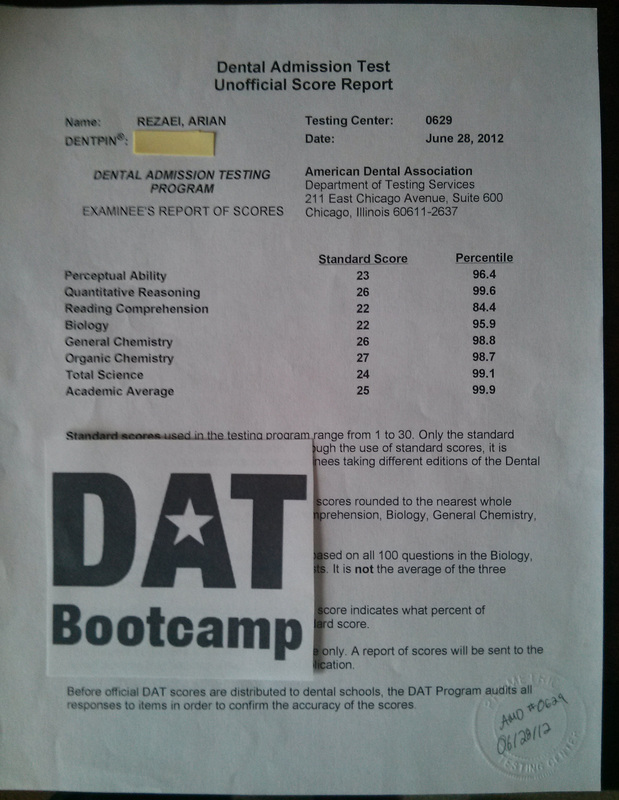 Here are three reasons why you need to use DAT practice tests during your DAT prep. Timing is a huge issue on the DAT. For example, in the total sciences section, you have less than a minute to answer each question. It’s even worse on the reading comprehension exam; you only have an hour to read three dense ~1,500 word passages and answer 50 questions. Simply knowing the material isn’t good enough on the DAT – you have to be fluent in the material to answer the questions rapidly. By practicing under timed conditions, you’re training for the timed pressure of the DAT. Believe me, it’s much easier to answer a question at your leisure while the TV is on in the background. Once you see a clock ticking down, you may get nervous and begin making simple mistakes. You can overcome this with practice and exposure to timed questions, so that the real test feels like second nature to you. The entire DAT process from sitting down to finishing the exam takes about four and a half hours. This isn’t a four and a half hour brain-numbing wait at the DMV either, it’s four hours of answering tough questions as fast as you can. You need to practice your test stamina by taking DAT practice tests, otherwise you’ll become tired and make simple mistakes on the reading and math sections, which make up a collective 40% of your academic average (AA). The truth is you don’t really know what you’ve mastered until you’re presented with a problem. There have been many times where I think I have thoroughly understood a simple concept, only to be stumped when I’m presented with a question and can’t consult my notes. These are the best moments while you’re studying, you have the opportunity to fix that gap of knowledge with no penalty. Over the course of completing more DAT practice tests, you will continue to strengthen your knowledge of the material while practicing under the conditions of the real DAT.